Warrick Is a practicing cardiologist and author with a passion for improving care by helping patients understand their heart health through education. Warrick believes educated patients get the best health care. Discover and understand the latest approaches and technology in heart care and how this might apply to you or someone you love. Hi, my name's Dr. Warrick Bishop, and I'd like to welcome you to my consulting room. Today I'd like to speak with you a little bit about stents. Stents are the scaffold that go into arteries to open up those arteries. They're deployed by being laid over a balloon. The whole device; the stent and the balloon are passed into that narrowing. The balloon is inflated. And then the stent stays in place as the balloon is deflated and then removed from the artery, leaving that scaffold in place which holds the artery open. So, stents are a fantastic technology that allow us to open up focal lesions or focal narrowings within the coronary arteries. They've actually been with us since the mid-'80s so that's 40 odd years experience that we've had stents. There are two main types of stents that I'd like to touch on, because you may well have heard these mentioned. The very first type of stent that we had was a bare metal stent. What that means is it was just metal, that's all it's made of. The very first stents were made out of stainless steel. These bare metal stents really revolutionized what we did. But one of the things that we found was that with time, the area that was opened up by the stent could grow back in and re-narrow the artery. That was what we call stenosis or narrowing within the stent. The term we call in-stent restenosis. So, the occurrence of this closure within the stent in a reasonable percentage of people led to questions of how we could prevent that, and really that closure was from the growth of cells within the wall of the artery. This led to the development of bare metal stents that were then impregnated with chemicals that might slow down growth of those cells within the artery wall. These new stents with an impregnated chemical were called drug-eluting stents in that they elute or they release a chemical as they sit in place. The drug-eluting stents became available around the early 2000s as an attempted solution to try and stop this in-stent restenosis. What they used were chemicals that we have used to slow down growth, particularly in the cancer area. Drugs that were first used are called sirolimus and paclitaxel. These are agents that are effective at slowing growth or blocking growth. The drug-eluting stents worked. And we continue to use them. In fact, these days drug-eluting stents represent the vast majority of the stents that are implanted. Well, you might imagine, as always, there are pluses and minuses to the equation for both these agents. One of the things that we also need for stents to be successful is for the thing inside lining of the wall of the artery to grow through the mesh of the stent, grow over it, and if you like, seal it off from the blood, so that the blood travels over it smoothly. Failure to do this can increase the risk of a clot forming within the stent. Well, it turns out that one of the advantages of bare metal stents is because they don't have any agents that slow down growth is that they get incorporated into the wall of the artery rapidly quicker, in fact, than the drug-eluting stents, and therefore they run a slightly smaller risk of clot forming within them, giving rise to sudden blockage and major problems. So drug-eluting stents have a benefit. And that benefit is less in-stent thrombosis or clot formation. The disadvantage with bare metal stents is that they don't prevent the in-stent restenosis or growth of the smooth muscle cells within the wall of the artery encroaching back and narrowing at the site of the stent. With regard to drug-eluting stents, these sort of stents, because they have agents that prohibit growth, don't get covered by the lining of the vessel walls quickly and therefore run a slightly greater risk of clot formation or in-stent thrombosis. This is often dealt with by giving patients longer treatment with agents that keep the blood thin. These are agents that work against the platelets or the sticky components of the blood. We use aspirin, Clopidogrel and clopidogrel-like agents to try and turn off the function of platelets. So drug-eluting stents carries slightly higher risk of in-stent thrombosis but a lower risk of closure within the stent. These days, because of our effective antiplatelet agents, we think that the balances toward the drug-eluting stents, we think with good anti-platelet agents, we can prevent clotting there until we give the artery enough time to grow over that scaffold. And we also get the benefit of reducing in-stent restenosis. If you do need a stent, it is possible that your doctor may speak with you about this. In certain circumstances, we will still use bare metal stentsm perhaps if you had upcoming surgery in a very short period of time and we knew we couldn't run blood thinning agents around that time. In very recent time we've had an innovation called biodegradable stents. And the objective of these tests was that they were going to the artery wall and then eventually break down. The most recent data out on the biodegradable stance would suggest that they are inferior to the drug-eluting stents. And it's unlikely that we will see too much more in that space. Well, I hope I've given you a little bit of an insight into stents, what they're about. What a bare metal stent is, what a drug-eluting stent is that you now know that they were initially made of stainless steel. I can let you know that they are modern alloys cobalt and chromium are a fantastic way to open up local narrowings within the arteries. Both have advantages, both have some disadvantages. On balance, your doctor will figure out what's best for you. In general terms, our drug-eluting stents together with a very effective anti platelet agents are most broadly used. I hope that makes a lot of sense to you. I hope you've enjoyed today's talk on stents. As always, thank you for joining me and I wish you the best of health. Goodbye. You have been listening to another podcast from Dr. Warrick. 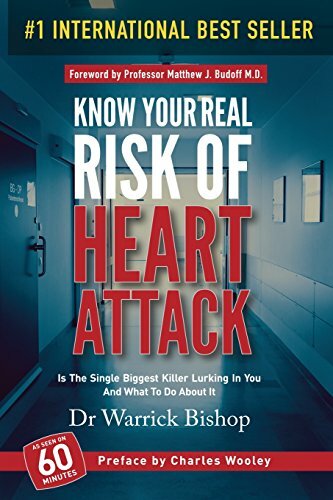 Visit his website at www.drwarrick bishop.com for the latest news on heart disease. If you love this podcast feel free to leave us a review.